Hi guys, at present time billion of users must have to use latest technology smartphone. These smartphones are developed by different mobile manufacturing companies which comes with latest features. When you buying any smartphone after some time his speed will be decreased. You will be frustrated when you get slow speed and lags with your costly smartphone. All of us want to enjoy faster phone experience. If you really frustrated with slow speed of your smartphone then read this article. With the help of this guide you will be able to easily make Android phone faster. You just spend few seconds and press few buttons on your smartphone to complete this process and feel the enjoyment of fast speed smartphone. There are lot of tips and tricks hidden in the electronic gadgets. But due to lack of knowledge as well as fear to corrupt the smartphone we don’t have to use these guides. In this latest modern technology each and everyone want great speed either in his life or electronic gadgets. So, this guide will be helpful for all those guys who want to make Android phone faster. I am 100% sure after reading this guide your smartphone will work faster. Lot of person use few apps to make Android phone faster or boost up the speed of his smartphone. But this guide is prepared by few simple steps there is no need to use any kind of apps. You must like this article, have a look all steps which is given below how to make Android phone faster. Step 1: First of all Enable Developer options on your phone. here is guide to enable Developer options click here. Step 2: Now open app menu then tap on the system setting and scroll down, at the last you will see Developer options, Now tap on the Developer options and open it. 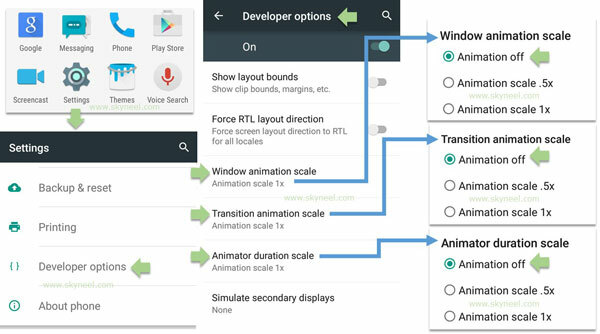 After a little scroll you will find Windows animation scale, Transition animation scale and Animator duration scale. See in this image. Step 3: In these animation scale set by default at 1x. Now open these animation scale one by one and tap on Animation off. That’s all . I hope you like this article. After reading this article you will be able to quickly make Android phone faster without using any apps. Kindly share your knowledge with your friends, family members and others. Thanks to all.